We’re diving into email marketing this month, a topic that we all know we should focus on but rarely do. 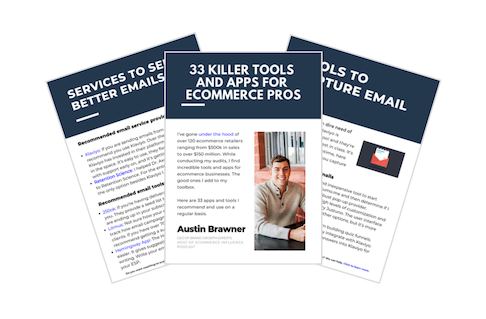 We’ll talk about the 3 buckets of ecommerce email marketing (prospects, subscribers, and customers) and how you should approach each segment. Can’t figure out how to turn a prospect into a subscriber? We’ll dive into it around the 8-minute mark. Learn the framework you can use to create an irresistible offer and then how to get that in front of people. One of the best ways is a pop-up. We’ll dive into the 4 different types of pop-ups so you can figure out what is right for you. 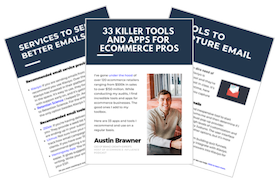 The 3 buckets to focus on email marketing. Ideas to better engage prospects. If you should use a pop-up or not. 4 Different type of pop-ups you can use. Also, ratings and reviews on iTunes (hopefully 5-stars!) help us tremendously and we’re very grateful for them. We do read all of the reviews and we’ll answer your questions or comments on future episodes.